Come immerse yourself in the Lore of the Grand Stair. Delve the secrets of the Lords of Gossamer & Shadow through the correspondence of Lucien, Lord of the Grand Stair, as he discusses evocative Expanses such as the Rickety Stair and the Grey Tower, and gain even more knowledge about his personal domain the Academy of Arbanes. Learn the earliest thoughts and abilities of Lucien, when the other lords knew him as the Young Turk, discover new cantrips and peruse the personal sorcery of one of the Six Great Lords adding its power to your own arsenal; uncover the lesser powers of the Grand Stair, along with the nature of Expanses and the wonders of the Carta. Unearth the advanced capabilities of Wardens of the Grand Stair, and finally find out about Lucien’s ally and previously unknown Gossamer Lord: Gretchen Shadrach, the Unshaken Shield. 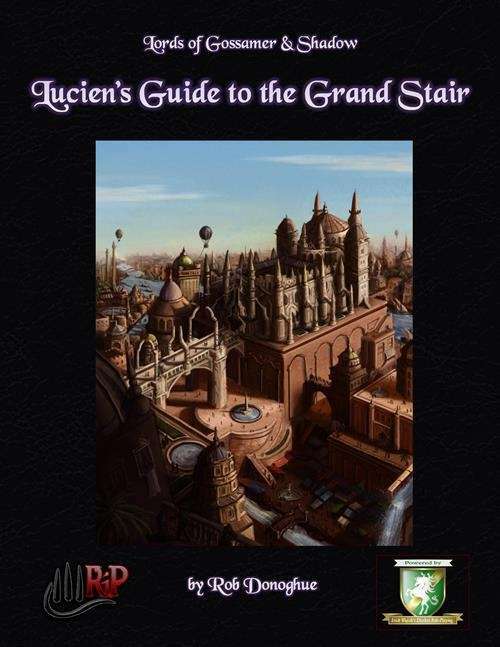 Brought you by bestselling and critically acclaimed game-designer Rob Donoghue (Fate Core, Dresden Files Rpg, Spirit of the Century) Lucien’s Guide to the Grand Stair is a perfect addition to Lords of Gossamer & Shadow (Diceless).